Martin has already covered the background of the Workshop Freie Musik series in his intro, but I’d like to bring back a few basic details to set the stage, so to speak. WFM started in 1969, the same year FMP released its first album. It ran until 1998, apparently cancelled due to a lack of financial backing. (An aside: I wonder, now that FMP itself has been resurrected for the digital age by Destination: Out if we won’t also soon see the return of both WFM and Total Music Meeting.) 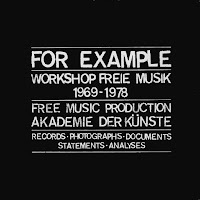 FOR EXAMPLE: Workshop Freie Musik 1969-1978 is a previously out-of print, LP-only set documenting 10 years of FMP’s Workshop Freie Musik. The whole set is divided into 3 albums: Nr.1 Soloists, Nr.2 Groups, and Nr.3 Orchestras. For the collector/completist, it’s a no-brainer, you’re looking at a history of the moment European free jazz came into its own. Then, on the other side of the spectrum, the neophyte, this particular set is also a no-brainer, a one-stop introduction to some of the biggest names in free jazz. And, hey why not, let’s go ahead and make it required listening for everyone in between! What makes this particular set so necessary is the range of both groups and years recorded, in addition to the sheer quality of all performances. Interestingly, there are no recordings from 1969’s inaugural Workshop. 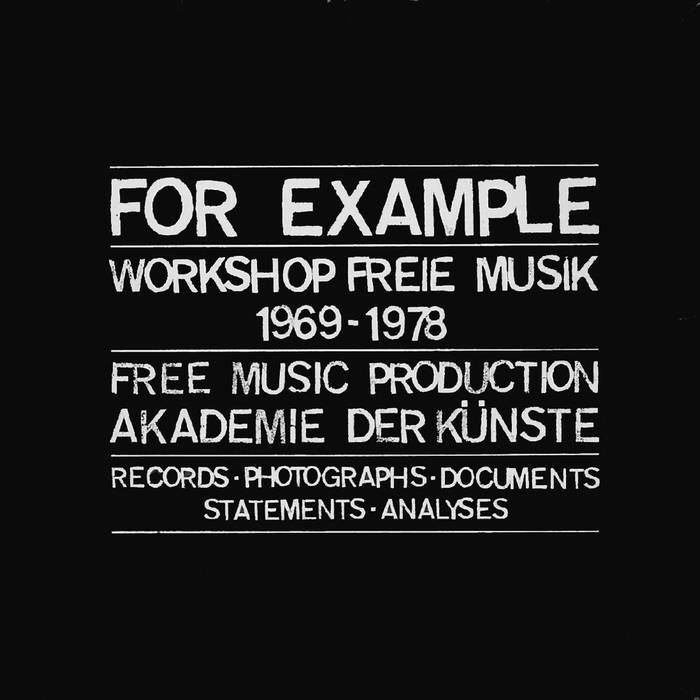 Instead, the earliest recordings come from the 1972 Workshop, well represented by Schlippenbach Trio, Brötzmann/Van Hove/Bennink with Mangelsdorff, Frank Wright Unit, and Willem Breuker Orchestra. As a snapshot of early ’70s free jazz, these feel so comfortable and familiar, imbued with all the rich nostalgia of a past era, and conjuring what so many think of when you say the words “free jazz.” The tempos are frenetic, the horns wailing, the improvisations simultaneously precise and primal. 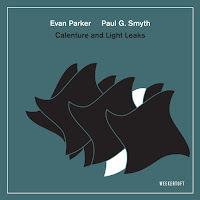 Most readers of this blog know the classic trio of Alexander von Schlippenbach, Evan Parker, and Paul Lovens. They’re the only artist here with two tracks, and both are fantastic. 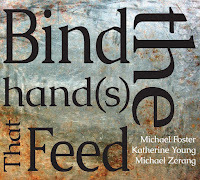 “With Forks and Hope” begins with all three in staccato mode, Lovens gradually opening up, as Parker teases out longer, piercing lines. “Then, Silence” contrasts Schlippenbach’s bluesy piano intro with a high, frantic solo from Parker. Later, Lovens breaks in with a swinging rhythm, and Schlippenbach settles into the upper octaves for some wild runs that fade abruptly. The Brötzmann/Van Hove/Bennink trio, another classic group, had just released an album with Mangelsdorff on FMP, Live in Berlin ’71. “Things and Stuff” settles into a comfortable rhythm pretty quickly, but the final few minutes are where the group shines, cooling down for some beautiful interplay. For Frank Wright, “Chapter Ten” was the start of his work with Alan Silva, making his recorded debut with Wright’s group. This is the group—Wright, Silva, Bobby Few on piano, and Muhammed Ali on drums—that went on to record Center of the World and Last Polka In Nancy?, so this represents one of the truly historic moments captured on this set. And that leaves the Willem Breuker Orchestra’s five-part “Biannale,” a fifteen-minute tour de force. Breuker’s great skill at arranging these compressed mash-ups is only matched by his group’s ability to pull them off. There’s Weill, of course, and Bach, but most of all there’s Breuker. Anarchic, hilarious, brilliant Breuker. The recording is a bit creaky, however, and there are cuts between each section that don’t seem quite lined up. Nevertheless, these are pretty minor complaints when you consider the scope of the set. Only one track comes from 1973, and that’s Globe Unity Orchestra’s “Thin in the upper crust,” credited to Brötzmann. It’s a sweeping that sounds almost as if it’s dissolving into a puddle of acid, as it winds down. (In case there’s any doubt, that’s meant as a compliment.) For a Brötzmann piece, there’s an impressive amount of restraint. There are three tracks from 1974. First, Steve Lacy’s solo performance of “Bone,” from the Tao suite. Lacy opens on a bright, bouncy statement of the melody, eventually gliding into a languid middle section. Schweizer/Carl Quartet’s “Konrad usw.” opens with a fierce solo from bassist Arjen Gorter. 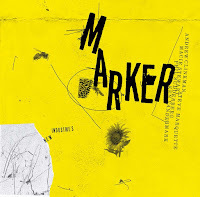 About two minutes in, Schweizer and Heinrich Hock join, creating a tense, tightly wound rhythm under Carl’s urgent sax. The piece builds in intensity for eight straight minutes, before a brisk statement ends the piece. And last from that year, an outrageous take on “Tetterettet” from the ICP Tentet. It’s superbly played, humorous, and swinging, everything ICP compressed into 10 glorious minutes. The real surprise comes from the 1975 sessions: Vinko Globokar’s Brass Group, a group with 11 trombones, a French horn, and tuba. “La Ronde” opens with a tumble of low brass, featuring some extended techniques, that gradually reveals itself to be a call-and-response. The one other track from 1975 is Paul Rutherford “Berl in zil,” a nicely lyrical trombone solo, with Rutherford accompanying himself on piano. The bulk of the solo performances come from 1976, beginning with Reichel’s otherworldly “Mariahilf.” Fred Van Hove’s “Daar Spelt de Baiaard Weer” is a brief, sparkling solo on prepared piano. 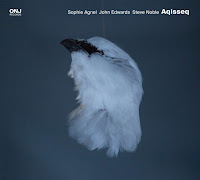 Tristan Honsinger performs the phenomenal “I Didn’t Care,” a cello solo juxtaposed with Honsinger’s wordless vocalizations, and Derek Bailey is captured in fine form on “Improvisation 27376.” Just to settle on Honsinger and Bailey for a moment, their solos are of particular historical importance, capturing the cellist and guitarist just after their early duo albums, and about 2 months before Company 1. The final two recordings, from 1977, are just fantastic. The first, a trombone solo from Albert Mangelsdorff, “Question at Midnight,” begins in a stately and bold fashion that’s gradually undercut by a variety of extended techniques. Mangelsdorff closes out with a humorous and twisted marching refrain. I don’t know what others will think, but the set’s absolute best moment, for me, comes from Johnny Dyani. “Soweto-Simbabwe-Mississippie-Child-Cry” has Dyani on bass, percussion, and his glorious vocals. His is the final track on the Soloists set, as well as the last track, chronologically speaking. It’s a wonderful moment to go out on: when Dyani ends, the crowd bursts into applause. All minor complaints aside, it’s impossible not to give this set my highest recommendation. As I mentioned, the range of performers and years captured represent some of the highlights of 1970s European free jazz. As I mentioned above, there’s a bit of a nostalgic glow to this era, but FOR EXAMPLE makes a strong case that this is a high water mark in the development of free jazz globally. I don't doubt the quality of the music, but $70 for 3 LPs? Very nice review, Lee, well done! Hardly ever was a five star rating more appropriate. I'm also a fan of Dyani's piece however, my favorite is the piece by the Frank Wright Unit. As to the price: I paid €400 for a decent copy two years ago - and that was a bargain! For a good copy you pay easily more than €700. A friend told me that Peter Brötzmann sold his copy in Japan for $1000. In this context $70 are okay, although it's not cheap. More than that, the music is easily worth the price. Hello Martin - if you're buying the LPs, I can understand the prices you're quoting. But for a digital download from Destination Out, the price looks very high, especially when compared against equally rare items from there in the same format. (And I'm speaking as someone who has purchased many FMP CDs, DO downloads, and also the Trost/Cien Fuegos reissues). This has nothng to do with the quality of the music - simply on principle, I'm not sure I want to pay that price. I agree, I don't think the price paid for a second-hand rarity can be compared to a digital download. The higher than usual price for the download is probably accounted for by the accompanying PDF of the book. There was a similar issue with the Cecil Taylor, Berlin '88 set, but in that case, the book was made available separately. I'm not sure why scanning a book is such an apparently expensive exercise. Ah, OK, with the booklet, the price makes more sense, even if it would be nice to have the choice. Listening to the samples, the music is indeed excellent. Yes, Colin is right, it has to do with the booklet. It's a 134-pages booklet in 12 inch format, designed by Brötzmann. The photos are very nice, typical FMP style. There are also lots of texts by people like Jost Gebers, Steve Lacy , Ekkehard Jost, Misha Mengelberg and others. If I sounded harsh, Anonymous, I really apologize, I know what you mean. It's lot of money, no doubt, and you made it clear that it's not about the music. Regarding the Frank Wright Unit, I’ve always had a problem with this band. 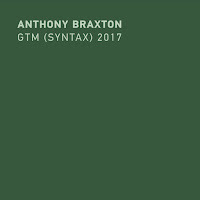 The music, heavily influenced by late Coltrane, seems to move to a certain plateau of sound and fury and stay stuck there, with no real variation or contrast. Over the Center of the World albums, this becomes numbing. It may be that at some point the music reaches a higher plane, but thus far it’s eluded me. I’ll have to try again. Regarding the cost, I will say I prefer the Catalytic model for box sets, where each disc is available for separate purchase. I do think in this case the price is worth it, because of the amount of music plus the booklet. In the end, it ends up being a pretty good deal. But a separate booklet purchase would bring the cost down to say $50 for the music, which would be ideal. Colin, I hear you about Frank Wright. My love for his music is purely emotional. His albums, though, feel deeply rooted in a time and place. So I wonder how he'll be received in another 10, 20 years. Given that the usual cost of an FMP Destination Out download is $11.49 per album, and there are three albums in this set, this means that the cost is spread at roughly $35.00 each for the music and the book. Well, Colin, it looks like the secret's out: math is not my area of expertise. Destination Out has a lot of merit making this music available again, but the price of this and the Cecil Taylor set are indeed set high. I am sure there is a lot of work involved, but this has the effect of leaving some people out, which includes probably other younger listeners.